Born and raised in upstate New York, Agatha D’Ambra has turned a passion for horses into a career. 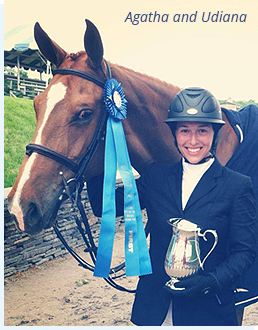 Agatha is the rider, trainer and manager at Trade Winds Farm, a world class equestrian facility based in Saratoga County, New York. Agatha’s passion for horses includes riding, training, breeding, jumping and competing. When she isn’t competing, Agatha enjoys teaching, and likes to keep lessons educational but also enjoyable for both horse and rider. Lessons incorporate a strong emphasis on balanced flatwork to create a relaxed, responsive horse and an effective rider. At Trade Winds Farm, horsemanship is used as the staple to every program. 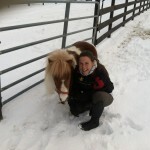 Agatha uses a compassionate approach in her training and is always mindful to keep the horse’s well-being a priority. Several years of experience as a horsewoman and competitor have helped Agatha to stay competitive at the top level of equestrian sports. Agatha has ridden under the expertise of some of the best in the industry, including Candice King, Ian Millar (Canada), Missy Clark, Debbie Stephens, and Olympic medalists, Peter Wylde and Beezie Madden. Agatha and her team at Trade Winds compete at many of the top shows in North America. Agatha is widely known for her success in the sport of professional horse show jumping, however her success is not limited to her many competitive victories. Upholding a reputation for being a trustworthy, responsible, dedicated professional, Agatha is striving to always better herself, and horses, and contribute to the growth of the industry. While she enjoys being competitive at the horse shows, her true passion is her horses and their well being. One of Agatha’s sponsors, Elite Equine Veterinary Practice, described her saying “She truly is a role model for aspiring equestrian professionals.” In addition, Agatha has also signed with Butet: a line of saddles and tack hand crafted in France, Samshield: a riding helmet and glove company and Pro-Elite: a line of products dedicated to the nutritional needs of high-performance horses. These recent sponsorships further support Agatha’s reputation for having only the best care provided to her horses. Most recently, Agatha has joined with KJ Creations: a line of unique products for horse and rider, Perfect Products: a specialized and dynamic horse supplement company, and Lukens Horse Transportation. Lukens has transported Trade Winds Farms’ horses and equipment safely up and down the east coast for several years. Furthermore, her dedication to horses extends beyond the competitions. In addition to training horses for show jumping, she also breeds warmbloods and thoroughbreds, facilitates early training for racehorses and spends time rehabilitating injured performance horses. She has spent countless hours training amateur show jumpers as well as donated time and prize money to several charities. Agatha was an ambassador for the non-profit Just World International, a charity that provides basic education, nutrition and vocational programs for children in impoverished communities, donating approximately $50,000 of prize money to the cause. She has also spent time working with Whiskers Cat Adoption to help abandoned, abused and stray animals find permanent homes. A true passion for animals can be seen in everything she does. If you would like to contact Agatha, please Click Here.